Derry man Michael Duffy admitted he was both shocked and ‘buzzing’ after Republic of Ireland manager Martin O’Neill contacted him this week. 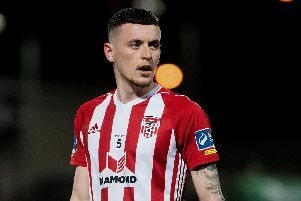 O’Neill spoke to the Dundalk winger insisting he wanted him to join up with the squad once his international clearance – having represented Northern Ireland at Under-21s level – has been processed. The 24-year-old, who has been in sparkling form for Stephen Kenny’s side this season scoring 12 goals, concedes that it would be a dream come true to play for his country. “Playing for Ireland is a dream and I would love to take that opportunity if it comes,” insisted Duffy. “I was delighted to get the phone call, I was buzzing with that. Duffy is keeping his fingers crossed that his paperwork is sorted in time for October’s Nations League double-header with Wales and Denmark. “Hopefully the paperwork is sorted and I can get selected for the next squad,” he added. “To be honest I don’t know what needs to be done or how long it takes, but I’m just hoping to get into the squad as soon as I can. “But I know I have to keep my performances up with Dundalk. I know that I need to keep playing well because if I don’t then he’ll just forget about me. As for O’Neill he believes the ex-St Columb’s College man can force his way into his squad. “I’ve a lot of time for that young man and I’m going to do something about it. I’ve spoken to him and I’d like to take him on,” he said. “I think he has good ability. It didn’t happen for him at club level with Celtic for one reason or another. “I think he picked up an injury on loan at Alloa and maybe Dundee and never really got back again and probably lost some heart and confidence and came home again. “But he has ability. It’s difficult at times to make a total appraisal of someone playing on an artificial pitch but he can go past a player.